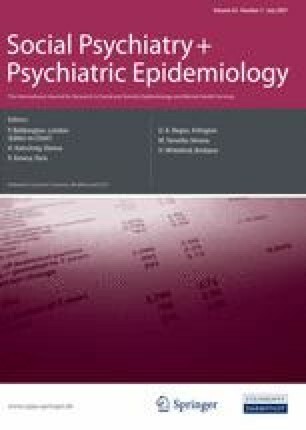 To determine the point prevalence, incidence, and remission over a 2-year period of psychosis in adults with intellectual disabilities, and to investigate demographic and clinical factors hypothesised to be associated with psychosis. A population-based cohort of adults with intellectual disabilities (n = 1,023) was longitudinally studied. Comprehensive face-to-face mental health assessments to detect psychosis, plus review of family physician, psychiatric, and psychology case notes were undertaken at two time points, 2 years apart. Point prevalence is 2.6% (95% CI = 1.8–3.8%) to 4.4% (95% CI = 3.2–5.8%), dependant upon the diagnostic criteria employed. Two-year incidence is 1.4% (95% CI = 0.6–2.6), and for first episode is 0.5% (95% CI = 0.1–1.3). Compared with the general population, the standardised incidence ratio for first episode psychosis is 10.0 (95% CI = 2.1–29.3). Full remission after 2 years is 14.3%. Visual impairment, previous long-stay hospital residence, smoking, and not having epilepsy were independently associated with psychosis, whereas other factors relevant to the general population were not. The study of psychosis in persons with intellectual disabilities benefits the population with intellectual disabilities, and advances the understanding of psychosis for the general population. Mental health professionals need adequate knowledge in order to address the high rates of psychosis in this population. The research at T1 was funded by Greater Glasgow Health Board and the West of Scotland R&D Mental Health Programme, and at T2 by the Chief Scientist Office, Scottish Executive Health Department (reference CZH/4/96). None of the authors have any conflict of interests to declare. We wish to thank Patricia Peters and Elaine Newall for secretarial support, and the professionals in the primary care liaison team of NHS Greater Glasgow and Clyde.